The Architectural League’s Emerging Voices award and lecture series spotlight individuals and firms with distinct design “voices” that have the potential to influence the discipline of architecture, landscape architecture, and urban design. The jury, composed of Sunil Bald, Mario Gooden, Lisa Gray, Paul Lewis, Jing Liu, Thomas Phifer, Bradley Samuels, Billie Tsien, and Ian Volner, selected architects and designers who have significant bodies of realized work that creatively address larger issues in the built environment. The Architect’s Newspaper featured the Emerging Voices firms in our February issue; stay tuned as we upload those articles to our website over the coming weeks. Vancouver-based Scott & Scott Architects’ founders Susan and David Scott will deliver their lecture on March 23, 2017, at The Architecture League in New York City. Click here to learn more! Combined with a sophisticated, pared-back approach, materials such as soapstone, marble, and concrete take center stage without overwhelming the building’s ability to be highly functional, whether as a restaurant or a residence. Susan and David often create or commission furniture, light fixtures, and hardware for each space in their workshop, promoting an overall sense of integration in every project. “There’s not a written philosophy about [our approach], but our background as site architects who often oversaw construction, as well as our own set of interests, lends itself to a focus on materials and making things,” David said. WIDC: Isn’t it good, Canadian wood? 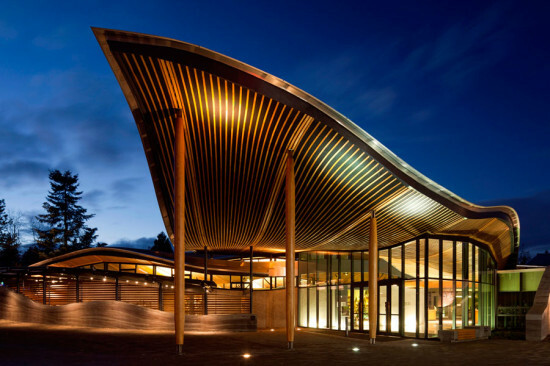 Timber was the obvious choice for the Wood Innovation and Design Centre (WIDC). This sturdy carbon-storing material is increasingly an alternative to concrete or steel in mid-rises and “plyscrapers.” For a province-owned building in Prince George, British Columbia, mandated to use local products, Michael Green Architecture (MGA) won the competition with a “dry structure” using no concrete slabs above grade (except one small vibration-controlling roof panel, notes project manager Mingyuk Chen) and deploying wood everywhere from posts and beams to mullions. 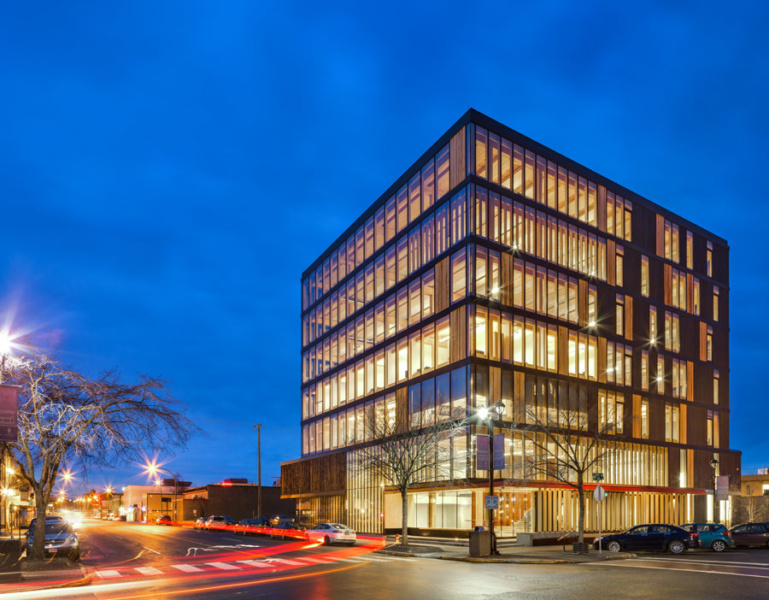 The 97-foot WIDC was North America's tallest all-wood building when it opened in 2014. A site-specific code amendment allowed nonresidential construction for this project, recalls Chen. Its lowest three floors house programs of the University of Northern British Columbia and Emily Carr University, with wood-industry offices above. 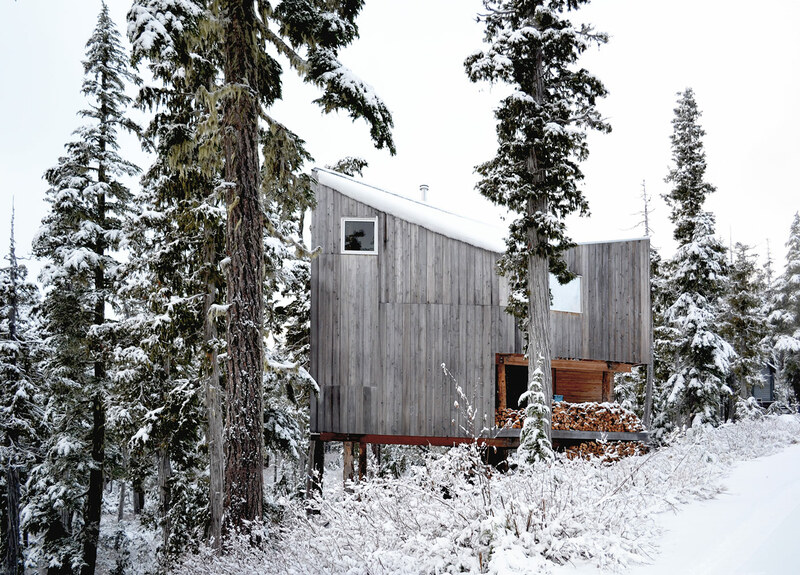 Materials include cross-laminated timber (CLT), mainly Douglas fir, for floor panels, shear walls, and core shafts and stairs; Douglas fir glulam for columns and most beams; laminated veneer lumber for the window mullions, entrance canopy, and feature stairs; parallel-strand lumber for load-transferring beams; and Western red cedar, charred or natural, for cladding. The facade, notes principal Graham Finch of envelope specialists RDH, uses Kawneer curtain-wall units of aluminum veneer attached to wood framing, with high-performance triple glazing and irregular patterns varying from solar-gain-maximizing southern fenestration to prefabricated structural insulated panels on the north. CLT is counterintuitively fire-resistant, Chen notes, needing no chemical treatment; if exposed to fire, it forms a carbon “sacrificial layer” slowing the char rate. Onsite dampness mitigation poses minimal challenge, Finch adds, noting that timber construction is widespread in Europe and ready for prime time here. “It forces you to go back to first principles and rethink.... It's not that it's hard; it's new, it's unique,” he says. Growing the WIDC's materials, he adds, took Canada's forests under three minutes. RDH Managing Principal/Senior Building Science Specialist Brian Hubbs will be speaking about "Facades for Wood High-Rises" at Facades+ New York City on April 6+7. 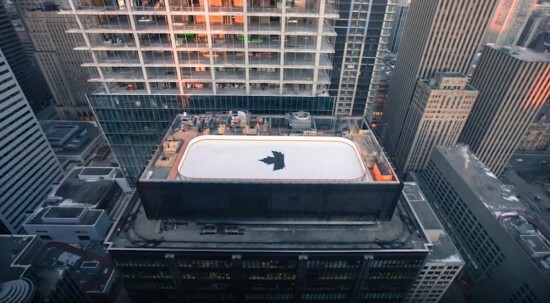 Molson Coors, the Canada-based beer brewing company has completed the construction of an hockey rink on top of a 32-story building in downtown Toronto as part of their #anythingforhockey campaign. https://www.youtube.com/watch?v=TST3BbW4-Us The mysterious rink was installed at 120 Adelaide St. W. in Toronto’s financial district over the last month and a half for an upcoming Molson beer commercial shoot. Building on last year’s #anythingforhockey event, which took hockey fanatics to a secluded rink on British Columbia’s Shamrock Lake high in the Rocky Mountains, hockey fans were asked to share what the sport means to them on social media. As with last year’s event, a handful of participants will be selected to play on the special rink. In a press release, Molson commented on how the rink is just the right size for a three on three game, which also happens to be the format for this year’s NHL All-Star game. https://youtu.be/cPzQl3l_D7Y Finished on January 10th, the rink is roughly one half the size of an NHL professional hockey rink. Like in the pros, the rink is has regulation height glass panels and netting surround the ice to prevent stray pucks from falling to the busy streets below. As for getting to the rink, new stairs were added to the building to provide access, but due to weight restrictions, only a limited number of people will be allowed up to the rink at any given time. Construction was accomplished with the help of cranes on neighboring building under construction, and some innovative ice and snow clearing solutions. As snow cannot be removed from the roof, the rink can be flooded with warm water to clear snow, and the ice itself when not in use. This technique is also used to smooth the ice, as a Zamboni machine is not practical for obvious reasons. Canada's Acton Ostry Architects, in collaboration with tall wood advisor Architekten Hermann Kaufmann, has begun construction on the appropriately named "Tall Wood Building," an 18-story, 174-foot-tall residential tower for Canada’s University of British Columbia (UBC) upper year and graduate students. The tower will be the largest wooden residential tower, but maybe not for long: MGA's 35-story Baobab is still awaiting approval. 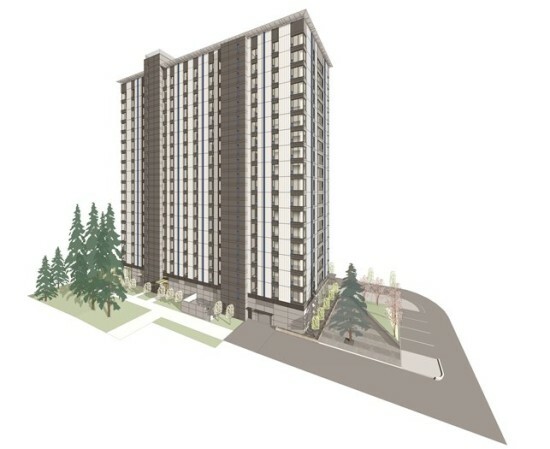 Tall Wood Building will house approximately 400 students and include 33, four-bed units and 272 studio apartments. The ground floor of the tower will feature both study and social areas, and the communal student lounge will be located on the top floor. The cost for students to live in this building will be the same and/or similar to other on-campus living options. Located on Walter Gage Road north of the North Parkade, the $51.5-million, mass timber superstructure will sit upon a solid concrete base. From the outside, you'd be hard-pressed to tell the tower has a wood structure. The building’s facade will be comprised of both white and charcoal-colored prefabricated metal panels. “This beautiful, new tall wood building will serve as a living laboratory for the UBC community,” UBC interim president Martha Piper said in a statement. “It will advance the university’s reputation as a hub of sustainable and innovative design, and provide our students with much-needed on-campus housing.” Tall Wood Building will join the family of UBC wood structure campus buildings, including the AMS Student Nest and Engineering Student Centre, the Centre for Interactive Research on Sustainability, the Bioenergy Research and Demonstration Facility, and the Earth Sciences Building. In addition to being a student residence, the building will also act as an academic site for both UBC students and researchers. 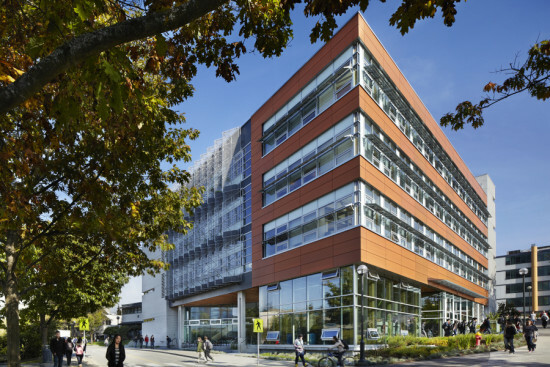 UBC is currently working toward achieving a minimum of LEED Gold for Tall Wood Building, and the building is scheduled to be complete by 2017. Building technology research center features wood, integrated photovoltaics, and green wall. When John Robinson began formulating a vision for the University of British Columbia's (UBC) Centre for Interactive Research on Sustainability (CIRS), he did not start small. Robinson, who is responsible for integrating academic and operational sustainability at the university's Vancouver campus, dreamed of constructing the most sustainable building in North America, a monument to and testing ground for energy-generating strategies. Invited to join the project in 2001, architects Perkins+Will sought an approach combining passive design and innovative technology. Featuring a facade of locally manufactured wood panels, high performance glazing, solar shading with integrated photovoltaics, and a green wall sunscreen, CIRS is a living laboratory for the research and practice of sustainable design. The initial concept for the building included 22 goals centered on three themes, explained Perkins+Will's Jana Foit. First, CIRS was to have a net positive environmental impact. In addition, the structure was designed to provide an adaptive, healthy, and socially generative workplace for researchers, staff, and students. Third, CIRS would utilize smart building technologies for real-time user feedback and testing. The building envelope was a critical component of the project's overall environmental strategy on both conceptual and practical levels. "The overarching design idea is to communicate sustainability, to make it visible and apparent," said Foit. In terms of pragmatics, the architects focused on reducing heat gain and providing 100 percent daylighting to the interiors. To reduce solar gain, Perkins+Will reduced the window area from the current code of 40 percent maximum to 31 percent. They installed fixed and operable triple-glazed windows on the ground floor, and fixed and operable double-glazed windows above. For cladding, the architects selected Multiple Ply Cedar Panels from locally-developed Silva Panel—one of the first solid wood products designed for rain screen application. "The exterior panels were detailed and designed to be removable, to allow for material testing and research," said Foit. CIRS' two-pronged solar shading program includes a network of fixed shades with integrated photovoltaics and a green wall. The former results in 24,427 kilowatt-hours per year in energy savings. The architects designed the green wall, meanwhile, to protect the west-facing atrium, which lacks a mechanical heating or cooling system. Together with a combination of solid spandrel and vision glass, the living screen achieves 50 percent shade during the warmer months. "The plants are chocolate vines, which lose their leaves in winter, allowing passive heat gain into the building," explained Foit. "In the summer, when the vines are in full bloom, the leaves provide shading for the atrium." In an important sense, the CIRS story did not conclude once construction was complete in 2011. Rather, the proof of CIRS' value as a demonstration tool is in its ongoing operations. The building returns an impressive 600 megawatt-hours of surplus energy to the UBC campus each year—and continues to rack up sustainability prizes, including the Royal Architecture Institute of Canada's 2015 Green Building Award. But perhaps more importantly, thanks to publicly available performance data and a "lessons learned" document compiled by UBC, CIRS has fulfilled Robinson's dream of promoting green design through the construction of a transparent, replicable model. StructureCraft fabricates an orchid-shaped roof that supports vegetation and Living Building Challenge principles.